A lot of methods and medications have been introduced with time which ranges from antibiotics to various herbal and home remedies. This article shall discuss the effectiveness of Azelaic acid in the treatment of acne along with its various benefits and side effects. Azelaic acid is basically an organic compound which exists as a white powder in form of saturated dicarboxylic acid. It is naturally found in wheat, rice, and barley and is used in a number of hair and skin conditioners. This medication is used for the treatment of comedonal or inflammatory acne. It is a form of dicarboxyl acid and kills the acne-causing bacteria thereby unclogging the pores that they otherwise keep occupied, to trap the excess sebum. It also tends to inhibit the manufacture of keratin that would otherwise support the growth and survival of these bacteria and microbes. It is used for correcting a number of skin conditions like rosacea, acne, skin pigmentation, melasma, post inflammatory hyper-pigmentation. Azelaic acid further facilitates a reduction in the production of melanin, as it also tends to function as a tyrosinase inhibitor. Azelaic acid has been a widely popular topical treatment for acne. It is often combined with an oral antibiotic or hormonal therapy. 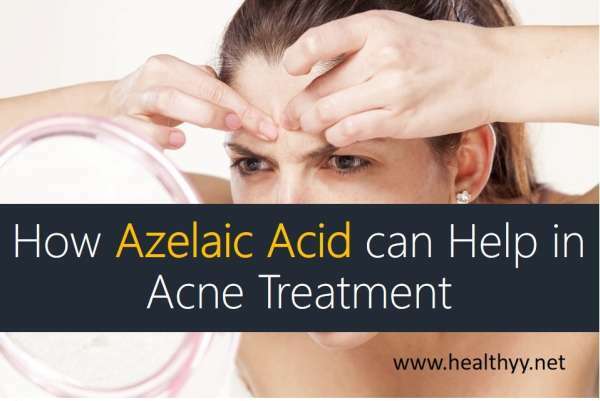 Azelaic acid tends to exhibit antibacterial properties which help in killing and thereby reducing the P.acne bacteria and inhibit their growth in the follicle. It also shows keradolytic and comedolytic properties which reduce the disordered growth of skin cells lining the follicle. It further functions as an antioxidant reducing the oxidative stress due to the presence of free radicals which further helps in the reduction of inflammation. Before it is applied to the affected area, the area should be washed and pat dry. After this, a thin layer can be applied and massaged gently. In order to get maximum benefits, it should be used regularly. Improvement is seen mostly only after a month of using it. No bandage should be placed over the cream unless otherwise directed by the doctor. This can be applied twice daily usually in the morning and evening if not otherwise directed by the doctor concerned. In order to facilitate regularity, it is usually advised that you apply it at the same time every day. Any contact with the eyes, ears or mucous membranes should be avoided as it is only meant for external use. A large amount of this medication should not be applied as it would only increase the risks of side effects and will not contribute towards speeding up the healing process in any way. It should be stored at room temperature between 59 degrees F to 86 degrees F (15 degrees Celsius o 30 degrees Celsius). It should strictly not be frozen. Its proper disposal should be discussed with the doctor or pharmacists. Azelaic acid, when used topically, might cause stinging and burning of the area on which it is applied. It may cause itching and tingling of the skin post application. It might result in worsening of cold sores and fever blisters (oral herpes), though very rarely. It might result in unwanted hair growth. Hypopigmentation or lightening of the skin colour might develop after the treatment. This usually happens to people who have dark skin. It might also cause a worsening of the asthma symptom like shortness of breath or wheezing. Though allergic reactions are rare, it might cause rash, itching or respiratory issues. In case of any of these symptoms being persistent, the doctor must be informed and consulted and if the situation requires, this medication should be put on a hold. The doctor must be informed about any medication that you are taking whether prescriptive, non-prescriptive, herbal or any other vitamin or mineral supplement. You must inform the doctor if you are allergic to Azelaic acid or any other substance contained in the medicine. It tends to make you sensitive to sunlight and therefore exposure must be avoided as much as possible. Also, whenever you go out, you must use a sunscreen or a protective covering. The doctor must be informed if you have suffered from any other medical condition earlier. If you are pregnant or breastfeeding or even plan to become pregnant, you must inform the doctor about it. Azelaic acid is not known to react adversely with any medication. However, you should try avoiding any such cream or lotion that might cause further dryness or irritation of the skin. These include cleansers or creams that might contain alcohol, astringent, abrasive and peeling agents. AzClear action: It is a lotion containing 20% Azelaic acid. Azelex : This also contains 20% Azelaic acid. White action cream: It contains 20% Azelaic acid and 2% glycolic acid. Finacea: It contains 15% Azelaic acid and comes in a gel form. Gentle: Most consumers were of the view that Azelaic acid was rather gentle on their skin as opposed to other treatments that make their skin rough. It was not harsh at all and did not cause any scabbing. Very effective: A lot of consumers found this treatment extremely effective. Some saw an improvement rate of 90% in two months and more than 50% in a week. The difference, after application, is visible over one night. Inexpensive: The cost of any Azelaic acid product is relatively cheaper. One tube/lotion of the usual quantity costs not more than 10$. It is therefore not a burden on your pocket. Dryness: Some consumers were of the view that Azelaic acid had caused extreme dryness on their skin. This might be due to the use of excess amounts of the cream. Burns: A few consumers complained that application of Azelaic acid made their skin burn and they had a stingy feeling. This again can be attributed to its excessive use. However, it has been suggested that this sensation tends to fade away with time as your face gets used to the treatment. Azelaic acid is one of the most popular forms of topical treatment which is widely used by people around the globe. Its antibacterial, antioxidant and anti-inflammatory properties attack the problem of acne breakouts from all four sides. Furthermore, it is also effective in fading away from the scars and has one of the lowest risks of hyper or hypopigmentation. What more, it is not at all expensive. If you have long been suffering from these breakouts then you might as well try this out. Additionally, it also has a very high safety rate as it rarely causes any side effects. Next articleInterval Training for Weight Loss: Benefits & 4 Ways to Start Today!